I don’t always use a recipe when I’m cooking. Over the past year, I have been cooking more with items on hand and making up my own recipes. Most of the time, they work out fine and there’s only been a few instances where I had to toss out the dish. Tonight, I made a pork roast and didn’t have any idea what to make with it when I put it in the oven. When it was 3/4 of the way roasted, I looked into the fridge and pulled out some veggies, intending to just wing it. I ended up with roasted cauliflower and a pasta/kale dish. Below are my recipes. In a zip-lock bag, combine 1/4 cup olive oil, 2 tbsp. lime (or lemon) juice, 1/2 tsp. chopped garlic, a handful of fresh Italian parsley (chopped), 1 tsp. salt and 1/2 tsp. pepper. 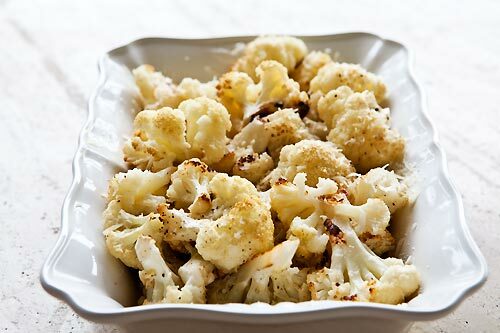 Add the cauliflower and mix well. Empty the contents into a casserole dish. Bake at 450 degrees for 20 minutes. Cook the pasta according to package instructions, then drain. Saute mushrooms in a little olive oil. Add kale and continue to saute a few minutes. Add a tsp. water to help wilt the kale. In a blender, add the pumpkin seeds, parsley, garlic, salt and olive oil. Blend until desired consistency (I like mine a little chunky). Mix all ingredients together and toss.